Rich Fagan and Son’s Tree Surgery and Landscaping - Driveways/Patios/Paths, Landscaper , Tree Surgeon based in Lower Kinnerton, Cheshire. 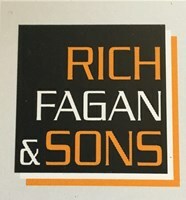 My name is Rich Fagan, I started my business in 1996. I’m a Qualified Tree Surgeon and Landscaper as are my three Sons who work along side me. We are a family run business doing all aspects of tree surgery, hard and soft landscaping and driveways, we undertake all domestic and commercial work. Please have a look at the photos from projects we’ve competed .